January 6th commemorates Epiphany – the arrival of the three kings — Melchor, Gaspar, Balthazar at the manger in Bethlehem to pay homage to baby Jesus with gifts of gold, frankincense and myrrh. Yesterday being Sunday many families came into central Oaxaca to visit the churches and markets and buy necessary provisions for the planned family gatherings. I was walking alongside the park this week and passed a couple of flatbed trucks packed with streamers, bamboo poles and papier mâché elephants and camels. Always a good sign something is up. The celebration, as is usual in Mexico, involves cohetes (seriously, did you think there would be ONE celebration in which loud banging rockets are not included?) and special bread: Rosca de Reyes (Ring of Kings). 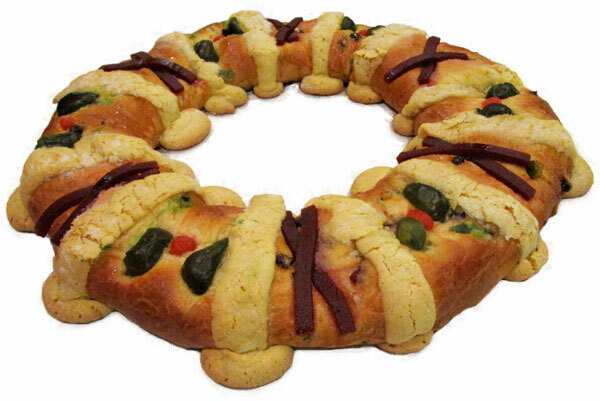 Rosca de Reyes is circular sweet bread which represents a crown, and is decorated with dried fruits and nuts. Families share this bread with a cup of atole or hot chocolate at night this time of year. 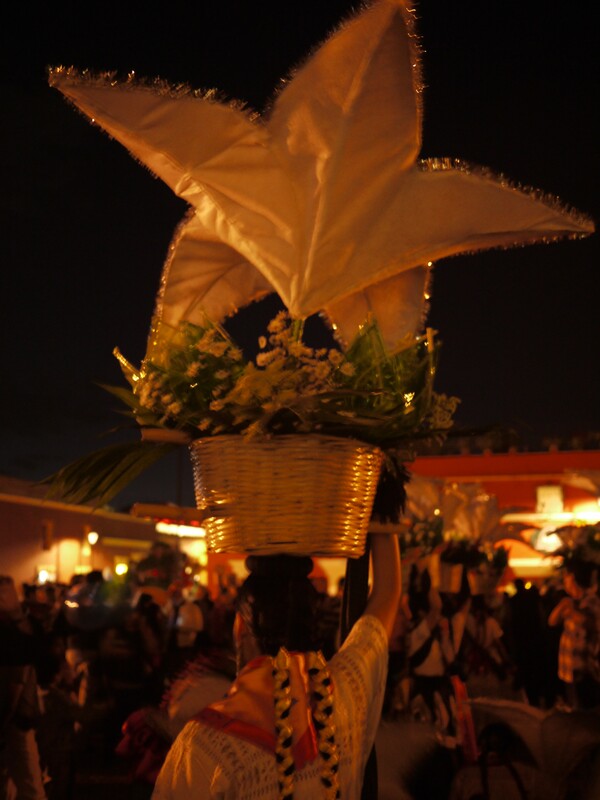 Last night, there was an amazing parade that set off from the front of Santo Domingo. 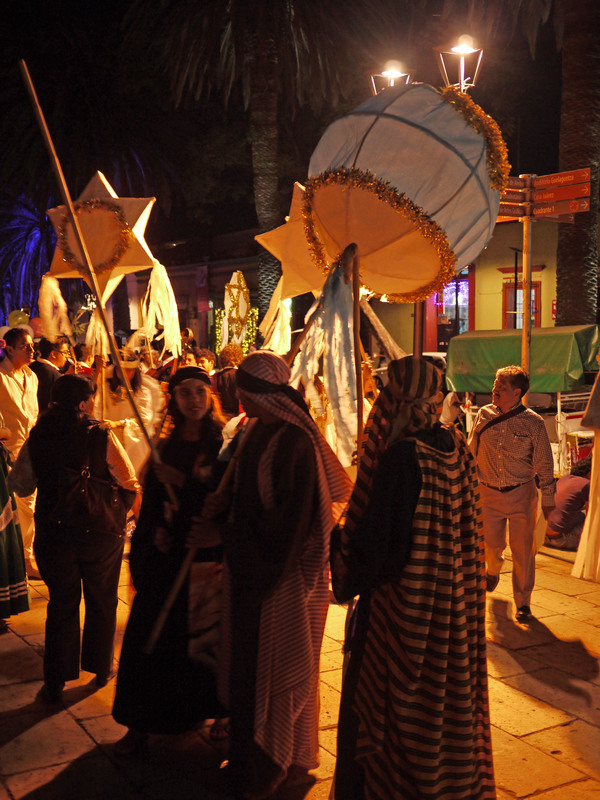 Three girls heralded the parade, dressed as angels or stars, following them were the three kings, then Joseph and Mary – holding a pottery calabeza representing Jesus, then assorted shepherds and townspeople, then the dancing girls holding giant silk flowers in baskets perched on their heads, and then finally church members took up the rear of the parade. 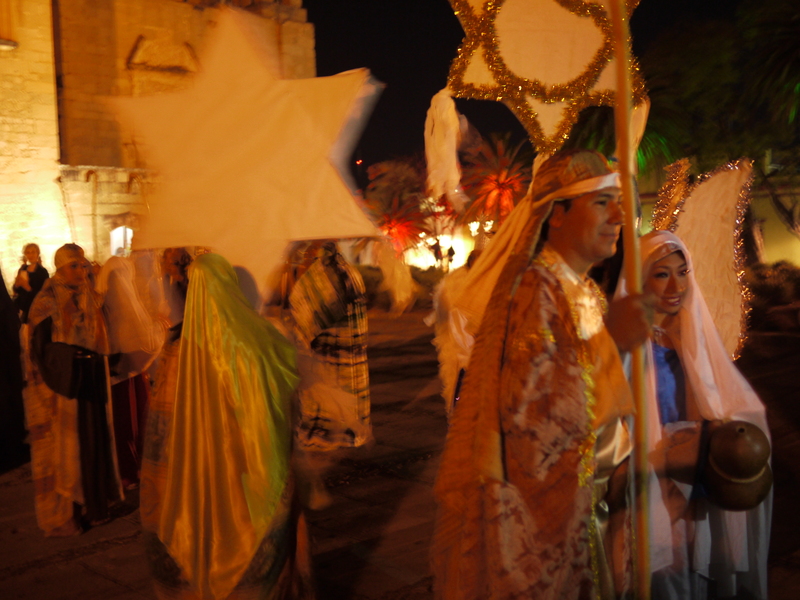 The costumed participants mingled in groups as they waited beneath the walls of Santo Domingo for the parade to begin, and parents took advantage of this, positioning their children in to stand with the three kings or Mary and Joseph so they could be photographed together. Of course there were fireworks set off up and down the main pedestrian thoroughfare, and people selling candy apples, elotes, slices of Rosca de Reyes, and cups of hot atole as the crowd waited for the parade to start. If you are offered a piece of Rosca de Reyes, be very careful. This bread also has a mini porcelain or plastic doll baked inside it, to represent baby Jesus. This refers to Jesus being hidden (not in bread) from King Herod in the original bible story. Whoever finds the doll within their slice is responsible for holding the next big party on February 2 — Candlemas Day (or at least supplying the tamales and atole). They are also responsible for taking the Jesus doll (or at least the one every Mexican family keeps in their home) to the church to be blessed on Candlemas Day. Sometimes several dolls are baked into the cake in order to spread the cost of the Candlemas celebrations among several people. I was offered a slice of Rosca de Reyes whilst walking near the zócalo yesterday and in some bizarre fluke managed to get the slice with the doll in it (luckily I wasn’t at a family gathering or somewhere official). This doll was actually quite small (and plastic) so worst case scenario you could probably swallow it if you were feeling particularly broke. I dare say a few of the dolls get mistaken for dried fruit and swallowed by elderly family members every year. So today is (I think) officially the last day of the Christmas celebrations here in Oaxaca. There is no time to rest though, next week we are celebrating something else: I saw a poster up in my local market with locations and times of events. Living here you can be sure there is always something happening. The bread with dried fruit and nuts looks so yummy!